For starters: Skype contacts refer to ID of friends added in Skype. You use these contacts to make video / voice calls and text chats with friends in Skype. You may want to backup contacts listing of your Skype for safe keeping. 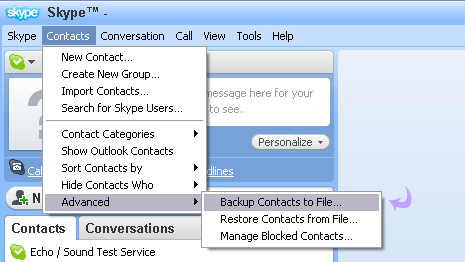 In an event of system or service crash, you can always restore Skype contacts from the backup file. 1. Open Skype program on your computer. 4. A new ‘save as’ window will open. Click “Save”button for saving Skype contacts in the form of VCF file. 1. Launch Skype program on your computer. 2. Goto Contacts > Advanced and click “Restore Contacts from File”. 3. Select the backup VCF fileand click “Open” button to complete Skype contacts restoration.